"MOTO The Movie" produced and directed by Taylor Congdon. In an age where many high-adrenaline sports have become watered-down exercises in marketing, dirt bike racing remains intensely raw; a dangerous enterprise populated with a colorful, profane cast of daredevils. Ortolani applies an artist’s eye to this unforgiving sport and the riders who pursue it, resulting in an unprecedented, behind-the-scenes window into this punishing competition. 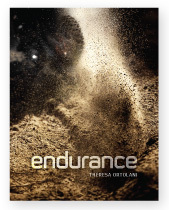 ENDURANCE offers embedded access to the races, the travel, the preparation, and a scope that spans three years' worth of WEC, GNCC, and Enduro races across the U.S. and Europe. Ortolani traveled thousands of miles to more than ten events in three different countries, in the process capturing Nathan Kanney’s ascent from underdog privateer to KTM Factory Team rider — an achievement that required beating world champions riding bikes three times the cost of his. 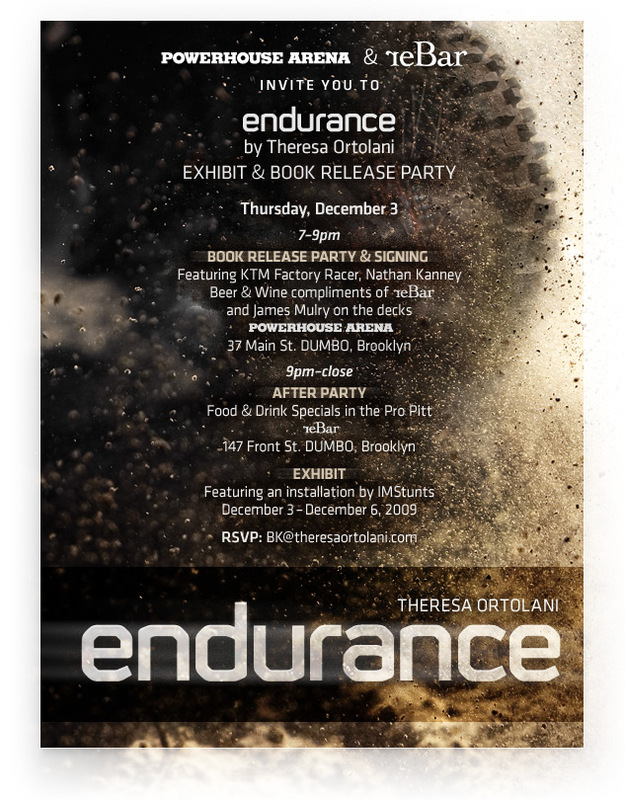 ENDURANCE includes photographs of Kanney's world-champion competitors and teammates including David Knight, Kailub Russell, Cory Buttrick, Homero Diaz, Ryan Mills, Anders Eriksson, and Bartosz Oblucki, with a cameo appearance by Travis Pastrana. Among the contributors are Ian Mclaughlin, Ezra Dyer, Eddie Brannan, Alexander Wolf, Nathan Kanney, Jerry Bernardo, Carrie Coombs Russell, Jason Weigandt, Kailub Russell, and Cory Buttrick. Theresa Ortolani is a Brooklyn-based photographer. She received a BFA from the School of Visual Arts at Boston University and was awarded a Sojourner Truth Fellowship for Graduate Studies in Fine Art Photography. She has developed and directed photography programs in conjunction with the Ansel Adams Center, the San Francisco Art Institute, NYU, and SUNY. When she’s not dodging dirt bikes or setting stuntmen aflame for her upcoming release, Don’t Try This at Home, Theresa spends time in New Paltz, NY.